I’m reading Good to Great again with some of my friends. We heard Jim Collins speak at a conference about his new book but decided (since we want to lead GREAT businesses/ministries) to go back and re-read his classic. This month, we’re reading the first 2 chapters. The first? A summary of his process written to excite us. The 2nd chapter? The meat starts. The book uses imperial data to prove why some “good” companies become great. It took years of research and it’s still very relevant. Leadership is tackled first. What he calls Level 5 leadership. The crazy blend of humility and willingness to move forward. Do you have that? As he explains the other 4 levels that leads to this mega-leader; I’m struck by something he doesn’t deal with specifically in the book. The ability to work with others. Never work alone. I need to include someone else in all I do. 2 minds usually come up with better creativity. Never cease to encourage. I want to see others excel. I don’t need the credit; I would rather have the pleasure of seeing someone else take it (yes, I need to repeat this over and over). Never stop recognizing others who allowed you to shine. I didn’t get here by myself. I couldn’t have done this without a supportive wife and kids or the bosses that pushed and motivated me. Or without my faith. OK. I confess. I haven’t read the whole 2nd chapter yet. I had to stop and write this blog. 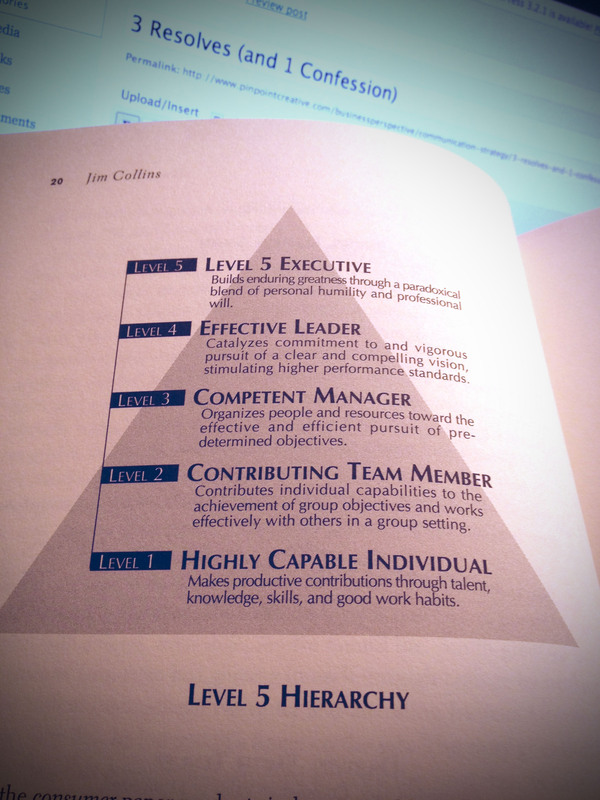 I want to be a Level 5 leader. But I need to work on some of the lower levels first.